Okay…so today I promoted Ebates on my Facebook and a few people got interested….so here is my favorite list of “lazy earners” – sites/apps/extensions I use to earn points that can be turned into paypal money or giftcards…usually of the Amazon persuasion. Average Earnings: $25- $40 per month in Amazon and Starbucks giftcards. You sign up and slap a sticker on your recycling bin (or don’t. It’s whatever since I’ve been earning well after that poor bin was stolen) and earn points that can be used for coupons to local establishments, e-giftcards, magazine subscriptions, etc. You can also earn points by doing the activities on their website that often give you great energy-saving tips. Average Earnings: $15 and a magazine subscription per year. Not a huge payout – but I’m dragging the recycling to the curb once a week and this is giving me something for that! They will send you paypal money, giftcards, or even a check in the mail just for shopping at websites you usually do – Groupon, Amazon, etc.! You just have to check their website or download the browser extension and it will do the rest! Today I bought a Groupon and used both EBates AND Swagbucks so I got about $5.20 back from a $40 Groupon purchase! May not seem like much…but it all adds up. I’ve saved myself at LEAST $28.71 in Starbucks since Christmas! I spent $90 on Starbucks in January last year and I am determined to cut that down! Making my own coffee is helping tremendously. So I didn’t have any plans to make fitness/weight loss a goal for 2015…until I tried to put on my stretchy jeans earlier and felt like a giant muffin. So I made an executive decision use my holiday AmEx giftcards to purchase a 15-punch card for fitness classes at a local gym. I use Swagbucks AND EBates so I only spent about $34 which s less than $3 per class…and anything under $15 per fitness class is a deal these days. I need zumba to get back into business! I consider this a win since I didn’t pay for it and will get cash back. It’s Saturday night and I am crashed out on my couch with my dog, a crochet project, and Swagbucks. I think I’m about to watch the LEGO Movie and soak up cable while I still have it. I tried to call Comcast today to downgrade, but didn’t get through before heading to work so I shall try again tomorrow! I’m currently paying $104/month and I am confident I can get that down under $100. So here’s a pic of me being cool on a Saturday night crocheting at home with my dog. I’m not out spending money!!! I haven’t been to Starbucks in a few days! I have purchased 3 bags of coffee and armed myself to the teeth with milk, creamer, and sugar. I also have about $35 in free Starbucks giftcards that I want to last me awhile. I would say I spent about $100/month at the bucks (this includes my money and giftcard money) and I am confident I can cut that more than in half. Bring my own stuff. Bring backup jars. So i am joining in the No Spend January on NCA’s Facebook page. I have 2 weddings and a convention this month. So I have modified this to only be no-spend for all but those 3 weekends. That gives me 8 days of buffer that I feel I need. Otherwise, I can do this! I just spend $58 at the grocery store and am prepared to make my own meals for the next month. I even have a crockpot ready to go for tomorrow morning of mexican chicken thighs! 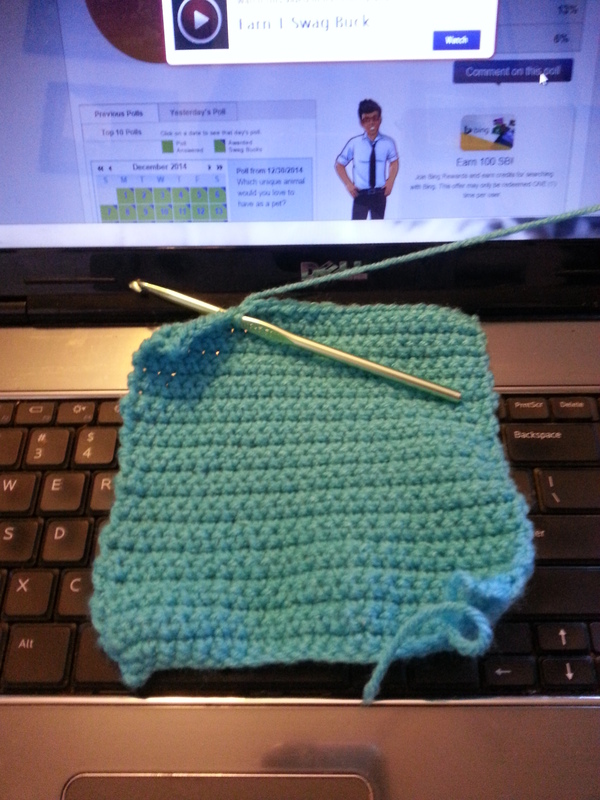 For $5.33 I have learned how to crochet! 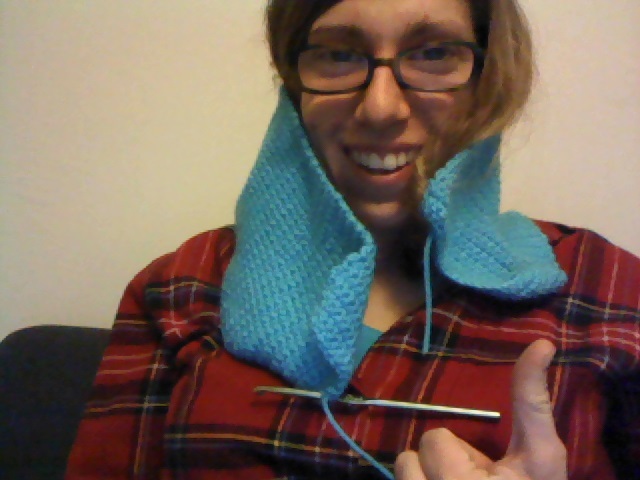 I’m making a scarf and it’s coming along really well. This goes under the “value my time” goal of 2015 since it’s something I’ve wanted to learn for a long time and it’s a great hobby that I can do anytime i’m sitting and I’m into that.